Before I get into this recipe, I’d like to make a little announcement. I recently made a Facebook page for this blog, so if you’d like, follow this link to “like” Hungry Hannah on Facebook! Anyway, back to the muffins. I must say, I have always loved a good muffin. As a child, I would love to get cinnamon or chocolate chip muffins from the local grocery store’s bakery and munch on them all morning. I remember some of my favorite muffins were the super chocolaty Weight Watchers ones that my mom kept in the freezer – I thought they were a treat but didn’t realize at the time they were secretly healthy. Over the years I learned that muffins are loaded with sugar and not exactly the most substantial breakfast, but in addition to that, eating a sugary, carb-packed breakfast has always left me feeling hypoglycemic. 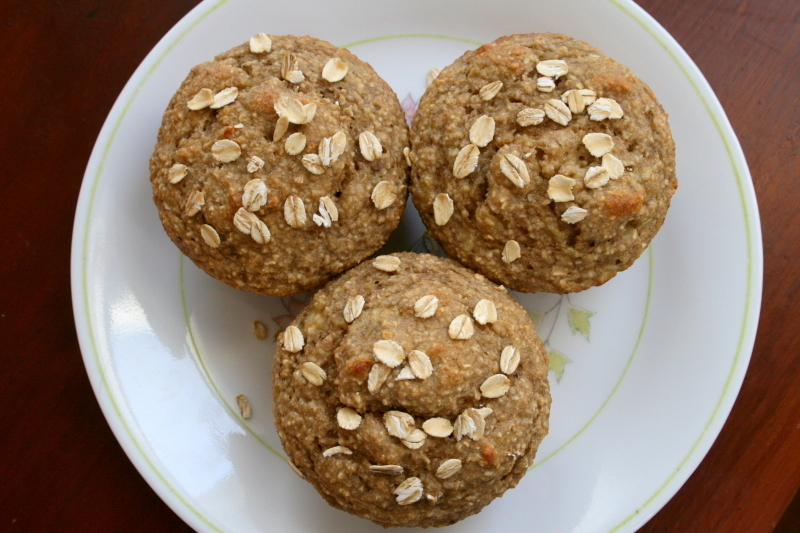 I still love muffins, but lately I’ve been focusing on healthy muffins that can be eaten for breakfast and not leave me feeling weak and shaky. 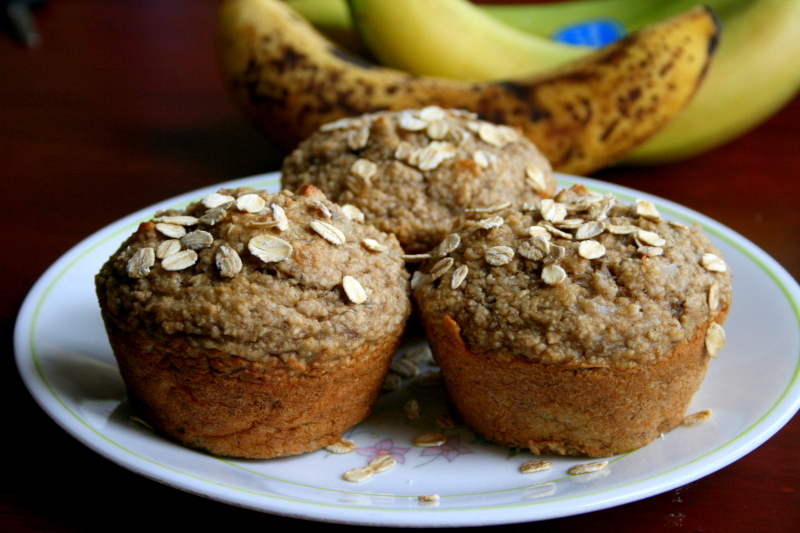 When I saw this recipe for Banana Oatmeal Breakfast Muffins, I knew I had found the one. 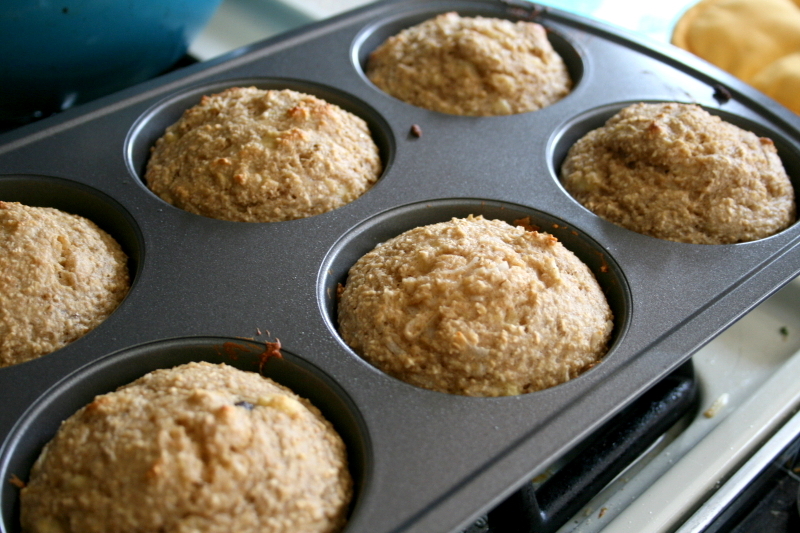 Instead of white refined flour, these muffins use whole grain flour made from… oats! 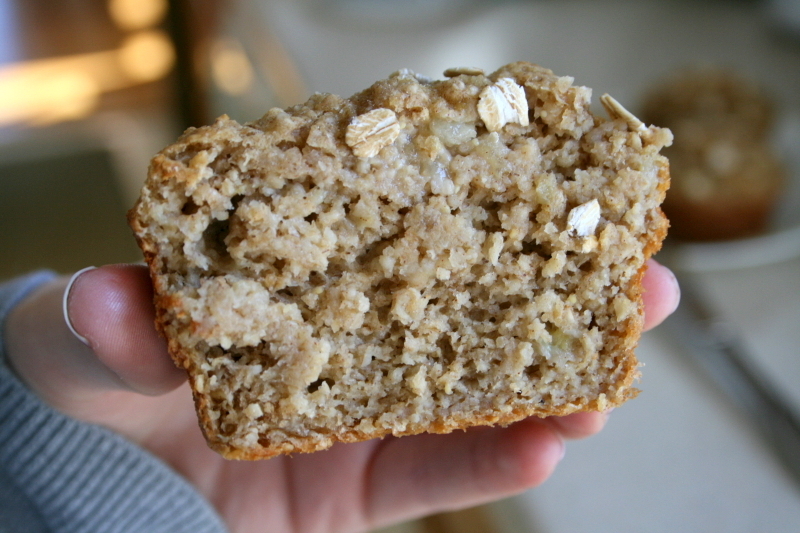 The oats are simply ground up in a food processor until they resemble the consistency of flour. Oat flour is chewy and slightly sweeter than white or whole wheat flour, and healthy, too. Oats definitely belong on the super foods list – they are low in fat, full of fiber, can help lower cholesterol levels, and can even aid in weight loss. I stayed true to the recipe for the most part, but I added cinnamon, used vanilla-flavored yogurt, and probably only ended up using about 2 Tablespoons of honey but thought they could have used a little more like 1/4 cup. If you want sweeter muffins, then stick to the 1/2 cup listed. optional: if desired, add some nuts, chocolate chips, or coconut flakes to the batter. yum! Preheat oven to 400ºF. 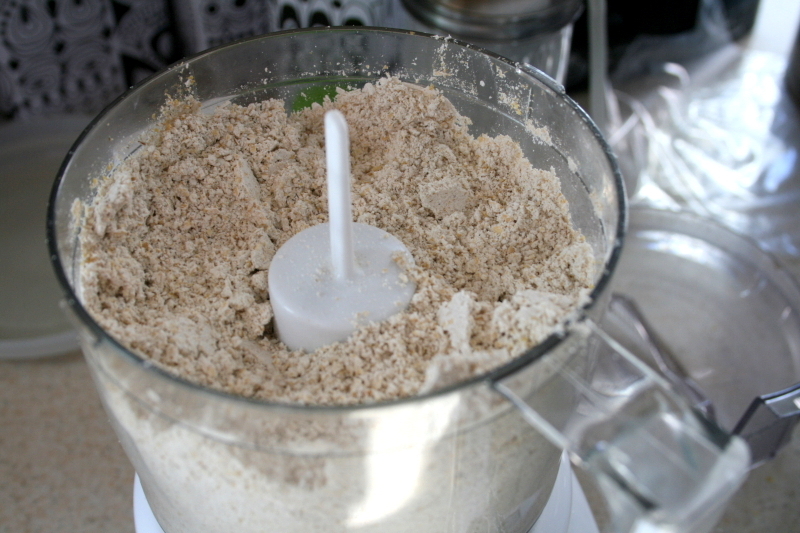 In a food processor, add oats and pulse until a smooth, flour-like consistency is formed. Add to a medium mixing bowl along with baking powder, baking soda, cinnamon, and whisk to combine. Set aside. 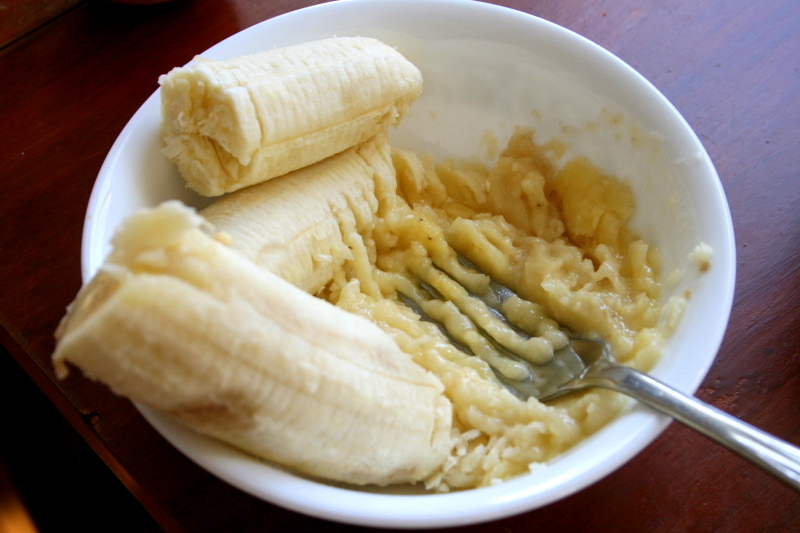 In a large mixing bowl, mash the two bananas until no large chunks remain. Whisk in eggs, yogurt, vanilla extract, and honey. Stir until well-combined. 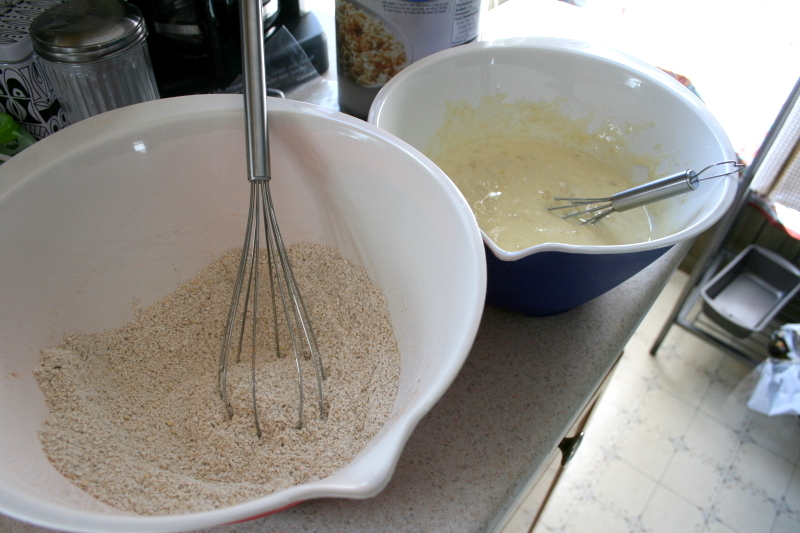 Add the dry ingredients to the wet ingredients and stir with a wooden spoon or spatula until a thick batter in formed. 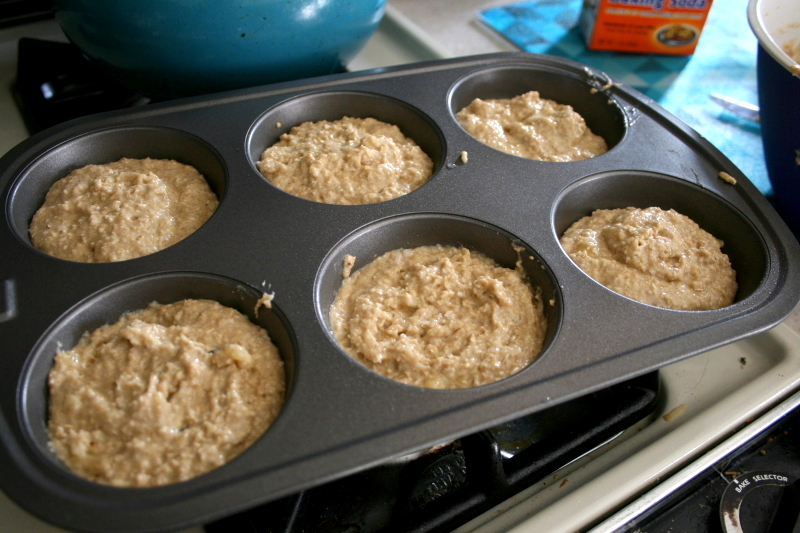 Spoon batter into a greased muffin tin, filling each section about 3/4 of the way. Bake for 18-20 minutes, or until an inserted toothpick comes out clean. Let cool slightly before eating. Add your oats to your food processor and pulse until they’ve reached a smooth, flour-like consistency. My food processor is older and the blades are dull, so odds are that your oat flour will be much smoother than mine. 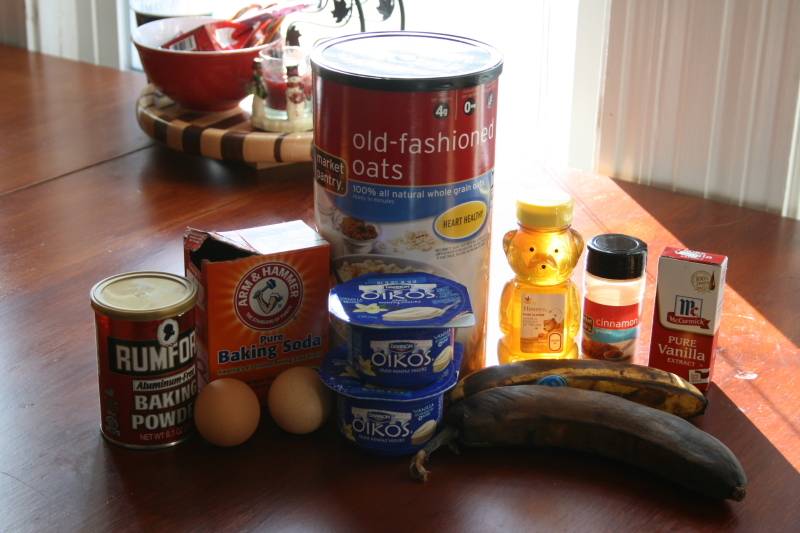 In one bowl, combine the dry ingredients as listed in the directions, and in another bowl, combine the wet ingredients. Slowly stir the dry ingredients into the wet, making sure no lumps remain. Spoon the batter into your greased muffin tin and bake at 400 degrees for 18-20 minutes. The muffins are done once a toothpick can be inserted and come out clean. And for my fellow New Englanders, stay safe and dry in the snowstorm! I’ve gotta give these a try. Looks yummy! awesome recipe (saw it on pinterest)! followed your measurements exactly but used a mini muffin pan (24 mini muffins). timed it to about 12 minutes and they came out to be the consistency of store bought banana bread (just right for me, moist but not dense and still crumbly). just the right amount of sweetness, too. I added almond flakes on top. will make these again. 🙂 thanks! Sounds delicious! I’m glad you liked them 🙂 I found them to be quite tasty for healthy muffins. I just saw this recipe on pinterest and was wanting to make it this week but was wondering if it would be alright to add protein powder to it? Hi Alison, i think this recipe would work well with protein powder but i might recommend removing a few tablespoons of the oat flour just so its not too dry! I dont have much experience baking with protein powder to be honest but it may help to look up a similar recipe that involves protein powder and adjust as needed!